This article at Slate (originally from IHE) describes the experience of a professor at Salem State who banned student emails. The good news is that more students came to her office as a result and her evals went up, so I guess if it works for you, you ought to keep doing it. But are professors really "assaulted" by email? That's a pretty strong verb. Duvall’s frustration is shared by many in academe -- or anyone with an email account -- from faculty members beset by questions they have answered both in class and in writing to students inundated by university email blasts. This spring, when Duvall taught at the University of South Carolina at Aiken, she adopted a new email policy to cut down on emails from students telling her they would be late, or would miss class, or would have leave early, or any of the countless others that could be handled face-to-face. A flowchart for email, really? I know that professors complain (in blogs, at CHE) about massive numbers of emails from students, but since we're dealing with a "my experience is data" topic anyway, I haven't experienced this. Students have usually been respectful and not asked pointless questions, unless my memory has erased those emails. Wouldn't you rather have an email than have the student show up at your office, sneezing and coughing and shedding used Kleenex into your wastebasket, to tell you she's not going to be in class? Or am I the only recipient of these "see, I am really, really sick and not lying" visits? Don't you think if a student emails you to say she'll be late or absent that it shows some attempt to be engaged with the class or respectful of your expectations that she'd be there? Yes, it's better if they stop after class to tell you that they'll be absent, and most of them do that anyway. If there's some special circumstance or absence, like a sports team event, wouldn't you rather have it in an email where you can document it instead of relying on your memory? I'm all for more in-person interaction with students, but this would, for me, be a sealing wax policy too far. What do you all think? In between admin, prepping classes, meeting, and still trying to keep some time for writing, I take out a few minutes to read higher education sites for distraction, which are filled with stuff I already know--teaching tips, how to handle email, and the like as though it is a fresh, new thing. I could have written them myself. This annoys me, because it violates my prime directive of not wasting my time. What should I do? You know the answer to this one: you are looking for distraction in all the wrong places, and you, not they, are wasting your time. Those sites are for people who are just starting out, and to them, those things are exciting and new. You know how kittens and puppies get intrigued by things that your cat or dog now ignore, and how nice you think it is that they are excited by them? This information is valuable, just not to you. Be happy that people find them valuable, and stop reading them, or you'll be saying, "hey, kids, get off my lawn" at the next faculty meeting. Oh, and pick up a book instead. I noticed that you wrote about your lengthy syllabus with lots of policies, and there is a recent Slate article about the same thing. I have two questions. First, how did two people decide to write about this at the same time? Second, do you agree with the article about just writing tl;dr and protesting the syllabus? There are only two explanations for your first question: either (1) I have massive powers of telepathy and the ability to make the universe bend to my will by echoing my thoughts or (2) it's the beginning of the semester and everyone is making up a syllabus. Obviously the first is the rational explanation. About your second question: No, I don't agree that the long syllabus is the decline of academia as we know it. When you explain the syllabus, you can emphasize certain parts, but if it's all there, they can read (or, okay, ignore) it on their own. They are not going to follow a link, and everyone knows it, so that's a non-starter. My only regret is the absence of sealing wax. I had a conversation today in which someone observed that her male teachers were more apt to share information about themselves when introducing themselves to the class than her female teachers. Do you think this is true? Signed, Gender difference or coincidence? I don't know, but I'm curious about this. Readers, what do you do when you introduce yourselves, or what do you think? I hope they're going to like the class. I worked hard on the syllabus and readings. I don't do much more the first day than explain the syllabus and introduce some of the assignments, since there's a lot to cover. If your university is like mine, it now has lots of policies, goals, and so on in specific boilerplate language that has to go into the syllabus. 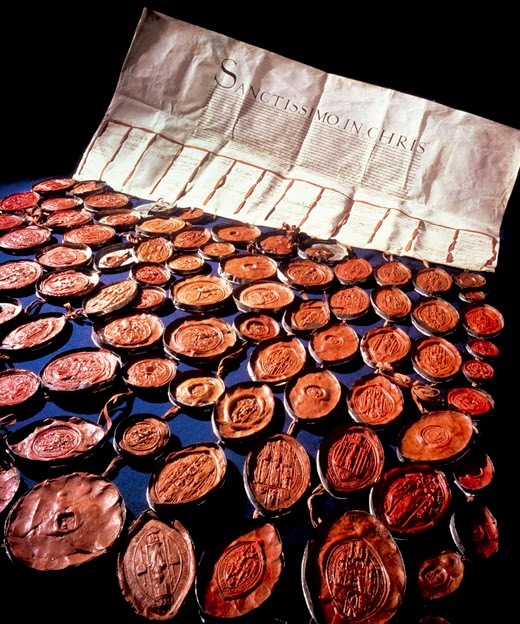 The syllabus now resembles Henry VIII's divorce petition to the Pope with all the wax seals. I wish I could add an interesting wax seal for each of the policies. I wish we could have a day of experimenting with sealing wax without giving the fire marshal a heart attack. It was nice to see colleagues when they are (and I am) relatively rested after the summer, even if we all worked all summer. It felt strange to be on campus instead of out for a walk/run early in the morning, looking at the deer in the fields and speculating about which little buildings behind people's houses might be writing houses. Flavia has good a post up about a book that she read and that, quoting Dorothy Parker, she says she wants to hurl with great force out of her house. It's a book about a guy having a mushy, lukewarm crisis of faith. She also says that she doesn't necessarily finish books any more once she's given them a fair (100 pages, more than fair) chance. Finishing books? Not necessarily, any more. I recently tried a modern classic, but after reading the preface about how it would be challenging, frustrating, and confusing, even a little boring with all the digressions, but that the 1000+ pages would be totally worth the effort, I let the Kindle app quietly return it to the library without forging ahead. Maybe I'll try again in twenty or thirty years. If I'm going to work that hard, I'd rather work, if you see what I mean. No, the thing that worries me a little is that in rereading some classics, including my recent stretch of visiting the mid-century males, my first reaction is often no longer "This is a Timeless Classic with Enduring Themes and Universal Truths," the gospel I was taught, but "Oh, great--more twentysomething guy problems." As Mark Twain once said of James Fenimore Cooper in a very different but totally hilarious context, I'm seeing through a glass eye, darkly. I can't tell whether this is a gender issue or an age one, since I've read so many more novels since first encountering those classics. I can still appreciate all the formal stuff and even a little stylistic fancy footwork, but in the big Crisis of Faith moments, a still, small voice in the back of my head is saying something like "Dude. You are worrying about this, really? Get a grip." The Alternavoice hasn't always been there when I read. I think reading all the junk on the web has cultivated it, from listicles to the faux questions at Slate and HuffPo and now all the news sites. It's not there with everything I read, which is a good thing. And the Alternavoice isn't all bad. It slips out in class sometimes, in some almost-snark pointing out problems in a text. I don't want to go all trollish on a piece of writing, of course, but it's good for the students to see that what we're reading isn't holy writ and that there's another way to look at the hero's dilemma. Maybe I need to write up an assignment where they can let their Alternavoices loose, but once it's out of the cage, as evidenced in my brain in the last year or so, it's out for good. 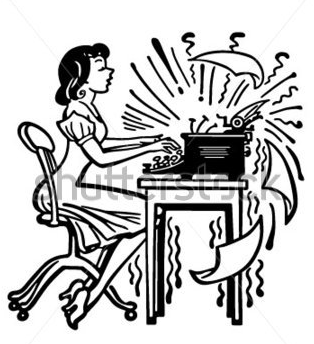 Do you have this voice when you read literature? Is there some situation or plotline that especially brings it out? 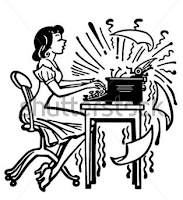 Someone just wrote a book that is entirely composed of tweets about writing a book. People post about how they are writing (#amwriting) and how good they feel about it. The author says that it's not cruel to make fun of these people. The book sells for $9 on Amazon. If I cite this using MLA, do I put it as an edited book? Did I miss the boat on collecting other people's words for free and charging for them? Is it possible that making fun of random strangers who post on Twitter could be considered cruel? I want my class to be a success on the first day. Do you have any advice? You can find a good list at Vanderbilt or your own university's teaching and learning center. That list is mostly great advice, although I don't follow this part under the "sharing information" section: "Personal biography: your place of birth, family history, educational history, hobbies, sport and recreational interests, how long you have been at the university, and what your plans are for the future." I figure if they know that I'm a humanoid life form and where my office is, that will about exhaust their interest in me. If they want to know more, they will ask. I would like to save paper by not printing a syllabus but by putting it in Blackboard/Canvas instead. Students will read it there before they come to class, right? Long ago, in a classroom far away, a dewy-eyed Ms. Undine believed as you do. Then she checked the usage statistics to see how many students had looked at the syllabus and emerged a broken woman. You don't have to hand out print copies of everything, but a print copy of a syllabus is like a contract for the class. Just the physical act of handing out something on paper will help them to take it more seriously. They are online all the time, and what's there is ephemeral to them. Since a piece of paper is no longer the norm, it has more weight than a bunch of pixels. As a distraction from the national news, here are snippets of a review of the film The Ivory Tower from the NY Review of Books, starring our old friend the MOOC. Below are the usual claims and the reality. 1. MOOCs will free up professors from the drudgery of lectures through the flipped classroom model and will allow them to "teach" through hands-on help with students. Professors will not become glorified teaching assistants or handmaidens to greatness. because that's just stupid fear-mongering on the part of thuggish teachers' unions. It won't happen because trust us, it won't, universities being unlike any other business in that they will provide free services for the public good once they can't charge for them. A conventional delivery system for “the personal touch” in the MOOC format is the so-called “flipped classroom.” Here a teaching assistant circulates in a roomful of students who have watched the assigned video, and helps them to sort out questions about details. The assistant—as Ivory Tower suggests with a single understated caption—will often turn out to be somebody who was once a professor but whom economies facilitated by MOOCs have demoted to the status of section leader. 2. Students will learn better and more efficiently in a MOOC. In 2013, the company [Udacity] was awarded a trial of its offerings in a contract with San Jose State University; and in July of that year, scores were posted for its spring term entry-level courses. The pass rate in elementary statistics was 50.5 percent; in college algebra, 25.4 percent; in entry-level math, 23.8 percent. Teachers have been fired en masse for results like these by administrators or politicians who would not sit for an explanation. 3. A rock star teacher in a MOOC makes a world of difference and will do a much better job than, well, 500 ordinary teachers. What you really want, [a Udacity adept] thinks, is the academic equivalent of a “rock star” to project knowledge onto the screens and into the brains of students without the impediment of fellow students or a teacher’s intrusive presence in the room. “Maybe,” he adds, “that rock star could do a little bit better job” than the nameless small-time academics whose fame and luster the video lecturer will rightly displace. Note that there's no proof here, because why do you need proof when you have one anonymous stockholder's or employee's opinions? We all know that people learn from celebrities. Maybe Kim Kardashian could teach a class. 4. MOOCs have always been about the greater good of reaching thousands with free learning. That's why university administrators, a notably starry-eyed bunch unconcerned with the bottom line, are so keen to implement them. Still, however fanciful the conceit may be, the MOOC movement has a clear economic motive. Many universities today want to cut back drastically on the payment of classroom teachers. It is important therefore to convince us that teachers have never been the focus of real learning. Don't multitask; partition your day. Your brain demands it. No post today, but "Hit the Reset Button in Your Brain" at the New York Times describes what the brain struggles with when interrupted. Read the whole thing; it's worth it. “People can’t multitask very well, and when people say they can, they’re deluding themselves,” said MIT neuroscientist Earl Miller. “The brain is very good at deluding itself.” Simply put, we can’t focus on more than one thing at a time. What we do is shift focus, trying to manage multiple threads. “Switching from task to task, you think you’re actually paying attention to everything around you at the same time. But you’re actually not” said Miller. Researchers like Miller say they can actually see the brain struggling. “You cannot focus on one while doing the other. That’s because of what’s called interference between the two tasks” explains Miller. “They both involve communicating via speech or the written word, and so there’s a lot of conflict between the two of them. The challenge is to define the problem – and the solution. “The current system lets other people add things to my to-do list” says Esther [Dyson]. Over at the New York Times, "Plot Thickens as 900 Writers Battle Amazon" informs us about the Hachette Publishing/Amazon struggle. I know that this is an important controversy, but what the NY Times published and what I read were two different things. ROUND POND, Me. 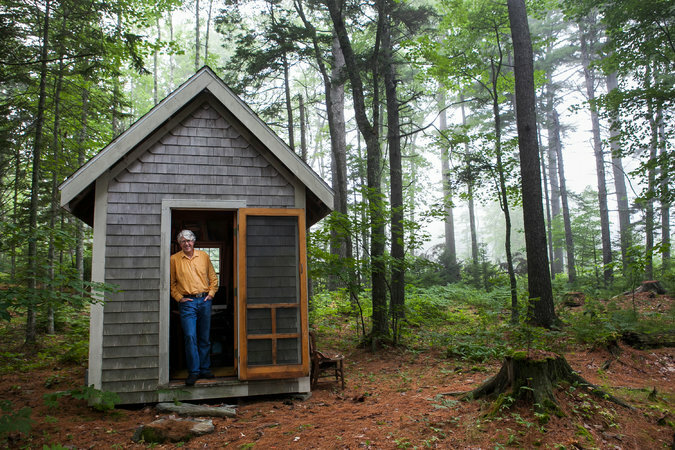 — Out here in the woods, at the end of not one but two dirt roads, in a shack equipped with a picture of the Dalai Lama, a high-speed data line and a copy of Thoreau’s “Civil Disobedience,” Amazon’s dream of dominating the publishing world has run into some trouble. Blah blah blah blah WRITING HOUSE PICTURE.